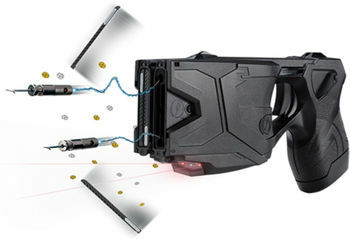 The Taser X2 Defender Kit Black with Laser, LED, 4 live Cartridges, PPW ,Target is designed by law enforcement the two-shot TASER X2 incorporates law enforcements most requested capabilities. 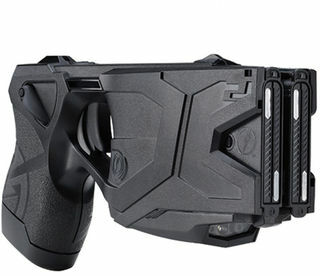 The Taser X2 is a great home defense piece of equipment that's feature rich, simple to use and similar in size to the TASER X26C. Its high performance dual LASERs improve accuracy and help take the guesswork out of aiming and have a performance power magazine that will last up to 500 firings. It has a weatherproof design to better resist rain and humidity and features self-diagnostics which tells you if the device is healthy or has a problem. The X2's back up shot capability for multiple targets or miss recovery with has been a leading edge in the X2 technology. Its warning arc while loaded prevents conflict from escalating.